Who And What Is WCW? Fifteen-year-old Kambili and her older brother Jaja lead a privileged life in Enugu, Nigeria. They live in a beautiful house, with a caring family, and attend an exclusive missionary school. They’re completely shielded from the troubles of the world. Yet, as Kambili reveals in her tender-voiced account, things are less perfect than they appear. Although her Papa is generous and well respected, he is fanatically religious and tyrannical at home—a home that is silent and suffocating. As the country begins to fall apart under a military coup, Kambili and Jaja are sent to their aunt, a university professor outside the city, where they discover a life beyond the confines of their father’s authority. Books cram the shelves, curry and nutmeg permeate the air, and their cousins’ laughter rings throughout the house. When they return home, tensions within the family escalate, and Kambili must find the strength to keep her loved ones together. 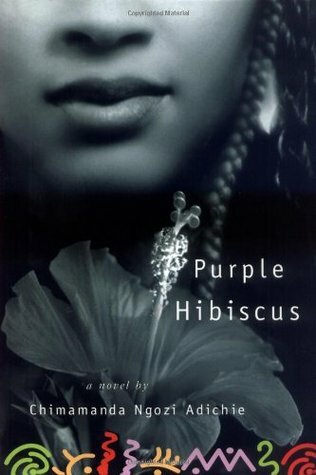 Purple Hibiscus is an exquisite novel about the emotional turmoil of adolescence, the powerful bonds of family, and the bright promise of freedom. I really liked Purple Hibiscus! I am really impressed with how Adichie can tell a story, because I couldn’t wait to see how things would go for Kambili and her family, and if things would get better for her. Reading the book, I realized how much I take for granted. Like being able to get gas for my car, and not have to worry about if there will be gas available, or food going bad because of random power outages. She makes a dysfunctional family compelling and different and fascinating, and it’s just brilliant. You feel everything, and she makes you feel it and she does an amazing job with making you feel every single thing. She shows everything really well, and so you don’t need to be told how suffocating it is to be at home. The characters feel like they’re people you’d meet in real life, and you really understand why people acted the way they did, and that people aren’t just good or bad but both. I loved seeing Kambili experience the world as it changed around her, and the safety she found when staying with her aunt and two cousins. She really is sheltered, and it’s so easy to relate and empathize with her, because you see how new some things are her. And I feel like I have a much better of what living in Nigeria is like during this time (which is never mentioned, and I’m really curious about when the book takes place). 4 stars. I’m just really impressed with this book and with Adichie. It’s hard to believe it’s her first book (not that all first books are bad or have to bad or whatever) but I really am looking forward to reading her other books, just to see how her voice and her writing changes and grows. Sounds like a wonderful book! I may have to go read it now. I think you would like it! If you want to get this blog delivered to your inbox, please enter your e-mail! 5+ stars: For the ever-so-rare book that warrants more than 5 stars!